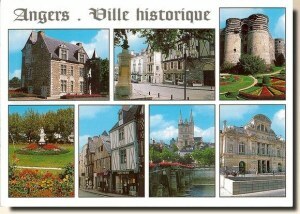 Angers is a city in the Maine-et-Loire department in north-western France about 300 km (190 mi) south-west of Paris. Angers is located in the French region known by its pre-revolutionary, provincial name, Anjou, and its inhabitants are called Angevins. Angers proper has a population of 157,000 inhabitants, while c. 283,000 live in its metropolitan area. The city traces its roots to early Roman times. It occupies both banks of the Maine, which is spanned by six bridges. The district along the river is famous for its flourishing nurseries and market gardens. It is well known for its fresh produce and cut flowers.